Limone is a buzzing resort on the upper western shore of Lake Garda, located at the bottom of the steep Dosso di Roveri cliffs. Lemons are rampant here, however, the name of the village comes from the Latin word “Limen”, which means border. Surrounded by mountains and water, the area is filled with citrus trees, fragrant oleander and lush vegetation, amid a poetic landscape. 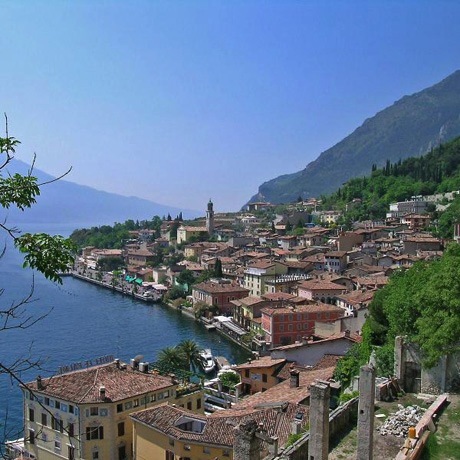 Limone was once a prominent fishing village, but has evolved into a famous tourist resort, and has become one of the more popular destinations at Lake Garda. Limone is situated at the narrow part of Lake Garda, where the cliffs are high and where olive trees, citrus trees and flowers abound. The climate is consistently mild and pleasant, and offers a perfect setting for special weddings and celebrations. Aside from the unbeatable climate, the area’s impressive surroundings present a host of unequalled spaces for a marriage ceremony! Tourists favor the old center of town, although the mountain region offers wonderful opportunities for scenic and romantic walks along the olive groves. The region’s renowned extra virgin olive oil is produced here. Limone gained recognition when a significant discovery was made in 1979. A protein known as Apolipoprotein A-1 Milano was found in the blood of the people in this town, which is known to remove fat from the arteries and flush it through the body very rapidly. The cause of this protein formation was found to be local population’s Mediterranean diet, which is primarily based on pasta, fish, olive oil, and citrus.